The health and wellbeing of your staff/clients/colleagues/attendees is of utmost importance when it comes to using lanyards. That's why we've created this page home to our collection of safety lanyards. 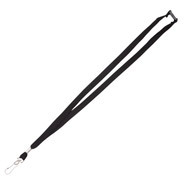 These lanyards each come with a secure breakaway clip that detaches when pulled. Meaning no one at your workplace or event is choked by a caught lanyard! We make sure to keep these lanyards in stock so we can usually do a same day dispatch upon payment so you get your lanyards as soon as possible!